Last year after some dissent in the African American Film Critics Group, three of the five founding members broke off and formed a splinter group, the Black Film Critics Circle, and released their own list of awards. Now for 2010, they've released their second end-of-year awards. In this year with very few films by or with black people, the winners are not particularly different from many other critics' lists. 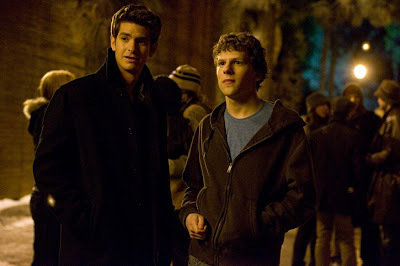 As a result, The Social Network came out on top with the prize for Best Picture. It also won Best Adapted Screenplay (Aaron Sorkin) and Best Ensemble. It didn't, however, win Best Director. Instead, that was won by Darren Aronofsky (Black Swan), which also won Best Actress for Natalie Portman. Colin Firth (The King's Speech) James Franco (127 Hours) tied for Best Actor. Both Supporting acting awards went to The Fighter. From their website: "Black Film Critics Circle is a film critics organization dedicated to honoring excellence of professionals in the film industry in U.S. and World Cinema. The organization launched in 2010 to celebrate achievements in cinema, maintain the integrity of a true critics organization and advance a collective vision of journalists of the black Diaspora. BFCC's mission is to acknowledge and honor the contributions by people of the black Diaspora in the film industry who work in front of and behind the camera while also welcoming promising new talent; Assist in the development of new talent in the field of entertainment journalism through educational opportunities, mentoring and strategic partnerships: Raise awareness of the significance of black film and black film history as a critical part of film culture and preservation." Pioneer - Haile Gerima - As the independent producer, director, writer of "Teza", Gerima has bee recognized for sustaining African Diaspora culture and empowering disenfranchised populations through his highly artistic and provocative work. His commitment to speaking truth to power is depicted in a body of work from the seventies up to his ground-breaking film Sankofa of the nineties. Gerima is a visionary with an eye for promoting black culture in film in a positive and historical light. Breakout Performance -Jaden Smith - Jaden is a rising star who is recognized for his excellent performance in the summer blockbuster remake "The Karate Kid." With an unmistakable charisma and charm, an acting ability beyond his years, and commitment and dedication to the role, Smith was a scene stealer. There is no doubt that Smith has a bright future ahead of him. Special Mention -Gareth Edwards - With his SF film "Monsters", Edwards took an original and organic approach to cinema bringing the industry back to its roots of visual storytelling. Edwards' creativity defies the trend of contrived narratives and reliance on big budgets and gimmicks and instead gives the audience rich stories and memorable characters. "Monsters" is a great look at how Sci-Fi is done right (human stories, not creature-features) by a Director who understands that less is more, with good visual effects employed economically to enhance the film - not define it.